... and that about wraps it up for The Sequence. I've been playing The Sequence on and off since I read the touch arcade review about a year ago. It's mostly fun but some puzzles are a bit too arcane. A huge break from it made it finally possible to nail the last two puzzles in the "core sequence." Those in the sandbox are a bit easier, and finding unimaginative solutions only took a couple of days of sporadic play. I played Kate's homemade version of this with her in Brisbane: she'd taken some Scrabble sets and painted some coloured shapes on the backs of the tiles. This worked fine, apart from it being incomplete. Well, today I was at Bondi Junction with Dave and found the travel version at b.amused for $20, so I bought a couple of sets. The build quality is not high: the paint flaked off some of the tiles when I unpacked it. Oh well. I won my first game ever against Dave in Centennial Park later on. ... and that about wraps it up for Lode Runner. Loderunner level 151, err, 1. I've been fascinated by this game since I was a kid. At some point I bought a copy of the IBM PC version on a blue 3.5" disk that I still have. I'm sure I played it more on the Apple ][ back in the day however, and I never saw an official disk for that platform. Apparently there is an iOS version of this classic now. 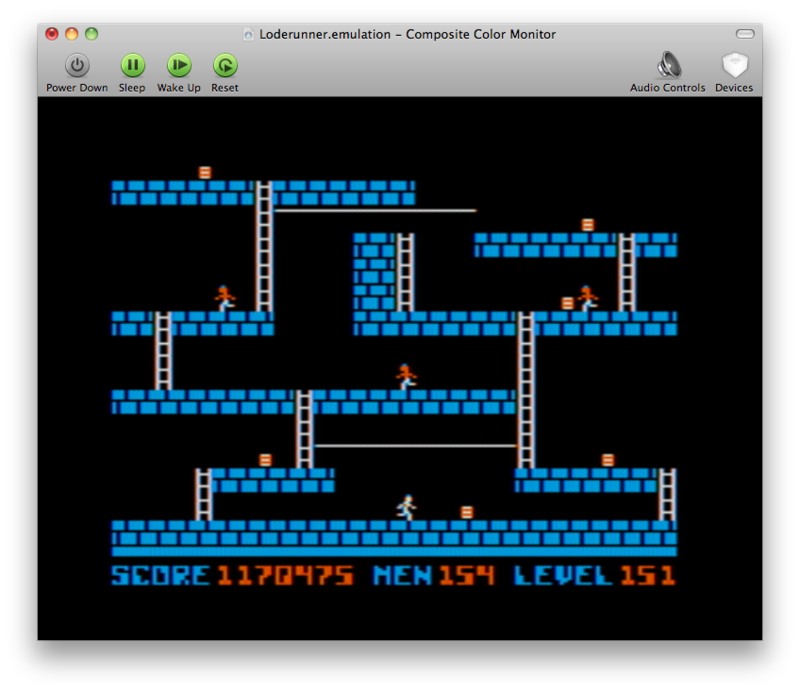 This time around I played all 150 levels in an excellent Apple ][ emulator: Open Emulator, which features all the monitor distortion you tried to forget, and the friendly sound the Disk ][ Drive makes while chewing your floppies. I chipped them €10. Don't take the men figure there literally; I saved and reloaded frequently. I always meant to check out Choplifter and so forth, but I fear I'll need a joystick to play them comfortably. I got Pandemic for Sandy, for her birthday last month. I thought it would be interesting to try something cooperative, unlike our usual fare. Albert, Sandy and Adrian and I played it at Albert and Sandy's place before dinner, which was a veggie risotto cooked by Albert, with much black tea. Our first game went a bit cockeyed as we infected 3 cities per epidemic, and looked at the fresh (not discarded) card piles. We won relatively easily, with the Researcher (Adrian) and Dispatcher (me) combination working well, and the Medic (Sandy) keeping things under control. The Scientist (Albert) didn't seem that useful. Our second game, after dinner, had Albert as the Operations Manager, Sandy as the Researcher, and me as the Medic. We played closer to the rules this time, but again it was an easy win; we scraped home with two breakouts left. Perhaps it would be more difficult if we didn't show our cards to each other. The rules are pretty clear once you have an idea how the game works. Quite fun but enough analysis paralysis that one game is enough for a night. I mentioned playing Portal 2 to Tom Sewell ages ago, and he told me that the co-op mode was where the action was. We finished it over two nights (this and about a month ago), taking perhaps 8 hours and 5 beers to reach the somewhere deflationary ending. It never got too frustrating, except when it involved knowing how close things were, such as stepping from one funnel to another; with the set-piece things (e.g. the launchers) you can just trust that the game designers got the distances, etc. right, but when I'm doing it with portals many don't look possible from where I'm standing. I had the same perspective problem with the solo version of this game. We played at NICTA, but I'm glad we played it in-person and not over the net. And that about wraps it up for Portal 2. That was also fun. Steam was selling it for $US15 over Christmas / New Year which is cheap enough for me. I'd forgotten my password and backdoor question and it seems their helpdesk went AWOL for those few days, so I created a new account. Maybe I'll do that for each game I buy. The game played completely fine on the MacBook Pro and archaic one-button Apple mouse. I expected the last stage to be a repetition-fest ala Portal but instead I got it first go, which was both disappointing and a relief. I got stuck a few times but never for very interesting reasons; the pump station at the top of the aircon shaft was particularly irritating as they switch off the paint (at the base of the shaft) for no discernable reason! Finding just the right spot to jump from was totally banal. As Tom Sewell observed there's a bit of overreach here: the need for narrative has killed the elegant simplicity of the original. The new mechanics look like a composite of the iPhone games the developers were playing in 2010... which are the games I'm playing now, of course. I quite enjoyed Where's my water?, which goes to show old-media Disney does know how to commission a good puzzle game. It's worth many a dollar, and they're only charging one. And that about wraps it up for Portal. Yeah, that was fun. I enjoyed it right up to the final stage, which was a bit too repetitive (do more-or-less the same thing n times), and the time limit destroyed the casual pacing of the rest of the game (stop and read the graffiti!). The puzzles were generally easier than I expected, and I only got really stuck a couple of times. Technologically I found the Steam client and Portal itself to be overly crashy on the new MacBook Pro, with the graphics subsystem often seizing up when I tried to exit or switch out of the game. This might be due to immature graphics drivers, or their inability to shuffle state transparently between the two cards. It also required a hack to get around its case-insensitive filesystem requirement. Bridges of Shangri-La with Pete R.
I managed to draw against Pete this time, despite him plying me with three beers. The two-player game is wearing thin, it must be said; roughly the game comes down to how many of your opponent's pieces you can tie up as students in unreachable villages, and if you can leverage a "private" bridge, where she or he cannot place a student and hence blow the bridge. We also had an arms race, where two maximally-populated villages faced off across a bridge. This looks like a who-moves-first loses thing, but towards the end of the game having some extra pieces really helps, if they can be placed, so losing seven students is not so bad. Set and Citadels with Albert, Sandy, Pete R., Ilan, Nitzan. This fortnight we played at Ilan and Nitzan's place in Maroubra. We started with Set, where one has to find three of the twelve cards on the table that, for each of the attributes, are either all the same or all different. (The nesting of quantifiers was hard for us new players to grasp, but became intuitively obvious after a few rounds.) The patterns are sometimes difficult to discern and it takes too much concentration to be a very social experience. Apparently there is a whole class of games like this. After that we had a full game of Citadels, using just the basic characters. I ended up winning but not very convincingly; it seemed to be a waste of time to pick up cards, as the magician wasn't a very popular choice for everyone else. I think I used it for more than half my turns, collecting just a little gold and building as soon as I could. It took maybe two hours to finish.